WE HAVE TOTALLY RENOVATING OUR CONDO IN JUNE 2017. WE REPLACED THE FLOORS, CABINETS, APPLIANCES, FIXTURES AND WE HAVE REPLACED THE CALIFORNIA KING WITH A 14 INCH COOL FOAM BED. Because we rent directly to you, your cost is significantly lower. A room in the Hyatt with this level of luxury and view does not exist but if it did would much more. During the whale season you can spend all day watching the humpback whales cruise by, slap their tales and breach on the lanai with an unobstructed eighth tenth and twelfth floor views looking directly to the West between Moloka'i and Lana'i. 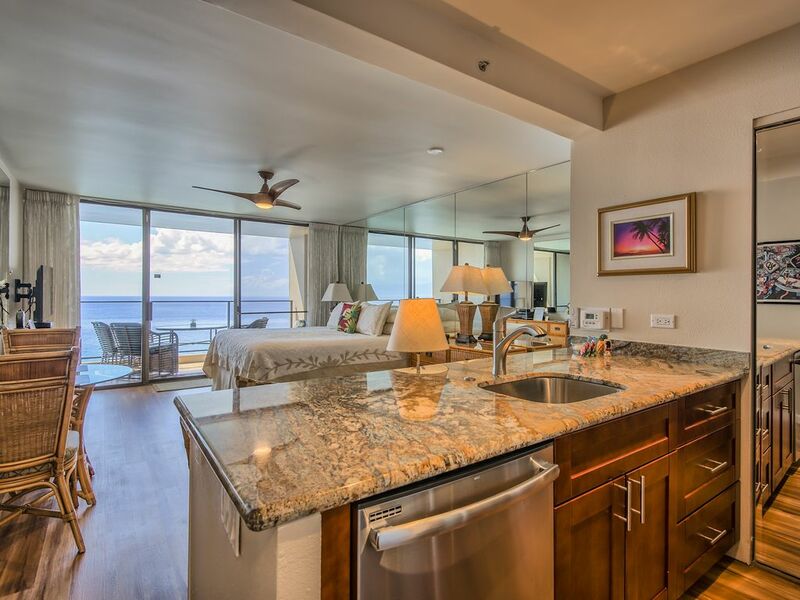 The Mahana offers WIFI internet access in the unit on the lanai, at the pool and lobby areas. Studio 1213 has High Definition Digital Cable and a High Definition LCD flat screen TV. Also has Central Air Conditioning. Studio 1213 is our Twelfth Floor, in a 12 Floor building, Studio Condominium in North Kaanapali Beach in Maui. We also rent a 10th Floor 2 bedroom suite at the Mahana. (VRBO# 205883) It was totally renovated to the highest standards a few years ago and has a magnificent view to the South as well as the West. Claire and I live in Holmes Beach, Florida area and Moorestown, NJ. We stayed in The Mahana in the early 1990's and fell in love with the complex. We returned in 2003 and I started looking for a place on a rainy day. I happened upon The Mahana and visited an open house. We started with a 10th floor studio and then added the 12th floor studio. We then sold the 10th floor studio and upgraded to the one bedroom suite which had just been gutted and redone. We love The Mahana and have many friends there. We have been there in all seasons but recently we have gone every Winter. The care taken to keep The Mahana in perfect condition and, of course, view. VIEW, VIEW, VIEW!!!! Direct Ocean Front! It is quiet but near all conveniences. Direct beachfront on the top,12th, floor. The unit was even better than the pictures. Ocean watching from the deck excellent. We could watch whales and turtles at will. Thanks for choosing our condo. I hope you can return. We are excited to get there this Thursday. Great view and friendly staff. I’ve been to Maui 15+ times and have stayed all over the island and have owned my own condos next door at Ka’anapali Shores. Ken’s condo was by far and away the best place we have stayed. We woke up every morning to the sounds of waves and the sights of whales, turtles and fish. The kitchen is perfect for a couple and the bathroom is ideal for a couple as well. We will be back, guaranteed! Thanks you for taking the time to post a review and especially such a glowing review. We love our condo and can't wait to get there in January! Love the Mahana. Not too big. Quiet, friendly atmosphere and the location is perfect. Our stay here was wonderful. The studio is spacious and the 12th story views were beautiful. The unit is quiet and feels tucked away while being close to restaurants and shopping. The beach chairs and snorkel gear were an added bonus. Highly recommend! Thank you for taking the time to write a review. I am glad you enjoyed our condo. We LOVE it too. I hope that you can return. A fantastic location with all the amenities you’d need. Couldn’t ask for more. We came for our honeymoon, and loved the location. It’s quiet, and has all the amenities. You are feet from the beach, so going from door to ocean was a breeze. Beach chairs and an umbrella were provided, and we loved that feature. Also, the humpbacks were present, so we were able to wake to see them each day. My sister's grandson and wife spent their honeymoon in our condo and left the day you arrived. It was my wedding gift. They had a great time too. Our daughter and son in law honeymooned there 11 years ago in late June and our first grandchild was born 9 months later. I hope you can return.